I found this User Conference very helpful and rewarding. It was great to share ideas and learn from other users, different ways their campus is using your platform. I was impressed at the versatility and customization offered by the Hirezon system. It really is tailored specifically to a school’s needs. All of the workshops were very helpful and I learned a great deal. Thanks again for organizing such a useful, fun experience. The 2018 User Conference was a great opportunity to network with Higher Ed peer-users. It was the perfect opportunity to compare recruitment practices along with the different ways we each use the various IE Modules. There is nothing better than spending time with people who really understand your world! The keynote speakers were excellent and I enjoyed exchanging ideas with them over dinner. Thanks for taking good care of us! Thank you for the opportunity to provide feedback on the conference. I would say it was one of the most useful conferences I have attended. Having the opportunity to see how my colleagues were using Interview Exchange platform, and to interact with the developers on a face to face basis was great. The food and the facilities provided were top notch, and the speakers were relevant and interesting. Thanks again, and I look forward to the next one! I was faced with making a decision as to whether to attend the Hirezon User’s Community Conference 2018 or the Regional CUPA-HR Conference this year due to limited funds. I chose the Hirezon Conference as I was hopeful I would obtain more immediate take-aways that would positively impact my institution. My choice was spot on! 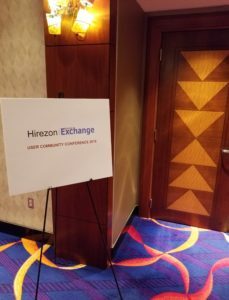 At Hirezon User Conference, I obtained more ideas and relevant information from attending this than I have in all my sessions attended in the past two years combined. The opening lecture was extremely engaging and every session that followed had my undivided attention. Every speaker was easy to relate to and all the content was relevant. That’s extreme value in itself! This Conference was overdue to occur, and I couldn’t be more pleased to have been able to attend, learn so much information, have met such wonderful colleagues in the HR field, and interact personally with all the Hirezon folks who work behind the scenes to customize their product for all their customers to ensure success. Thank you Hirezon for hosting such a wonderful event! I’m already looking forward to next year. Thank you for hosting one of the best conferences that I have ever attended! Mohegan Sun Resort, CT was an excellent choice to host the event, and the speakers were engaging and very informative. It was a pleasure meeting your support team in person as well as fellow users in higher education and learning how they use Interview Exchange platform to improve their processes. It was truly a great time, and I look forward to attending again! The conference was very informative. The presenters were well prepared and the location was beautiful! The networking opportunities were invaluable. I especially liked the different perspectives on recruiting, hiring practices, and on-boarding topics that were presented. Thank you and look forward to working with you in the future. The Hirezon User Conference was an excellent opportunity to interact with other institutions of higher education to learn how they utilize the system and overcome their recruitment issues and challenges. Learning about the latest features and future upgrades allow us to think strategically about our recruitment process for the coming years. 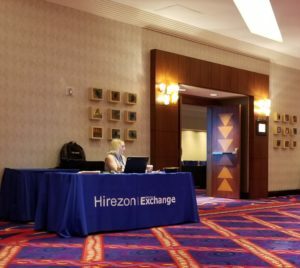 We found Hirezon user conference to be informative and a great opportunity to see how other clients are utilizing your products. We valued the insights on product enhancements and future offerings as well. Dr. Lee was an engaging and knowledgeable speaker that we learned much from. It was worthwhile. Looking forward to the next one! I really enjoyed the conference! It was extremely informative and allowed me to make some great connections with my peers at other schools. I am already looking forward to next year’s conference. Yes. We did enjoy the conference. It was very informative. I enjoyed the Opening Lecture given by Dr. Lee. I enjoyed learning about how Interview exchange can definitely streamline the recruitment and hiring process for full-time, and part-time/adjunct staff. It appears to be a time saver! I enjoyed hearing about how Worcester State is definitely using it for the Student Hiring process as well. Many colleges are definitely maximizing Interview Exchange patform. So, hopefully, we will be able to do the same. We are in the process of implementing Hirezon/Interview Exchange applicant tracking system and by attending the conference I was able to gain a better understanding of how the system works. The presentation by other colleges made me aware of the additional capabilities and efficiencies of this system. I was able to meet and learn from colleagues about their experiences of using the system efficiently in the recruitment and onboarding process.